All They’re Cracked up to Be III- Winter Flours | Food It Yourself! So, those pepperminty macaron cookies I made for Christmas were delicious. However, now I have some random almond flour to use up. I like almonds, but I hate the quack-tastic cult status it has attained among those who blindly and needlessly embrace and anti-grain fad. I’ve said it before, I’ll say it again- unless you have a physician diagnosed condition (allergy, celiac disease, etc.) there is no known advantage to giving up gluten, grains, or any other food. Google the science for yourself; there are people who study this for a living. After much searching I was able to find this interesting recipe for crackers from a company that embraces all the flours. I’m ready for a snack. To the kitchen we go. Four ingredients? I can handle that! There are a bunch of seasoning options noted in the recipe but I wanted to go for the basic option on my first try. At first blush I was convinced this would not work. Then I remembered that non-grain flours work with liquids very differently than grain flours do. I used a large serving fork to mix the ingredients. It worked very well. It did not take long to get a singular lump of dough. I decided to roll it out in batches. 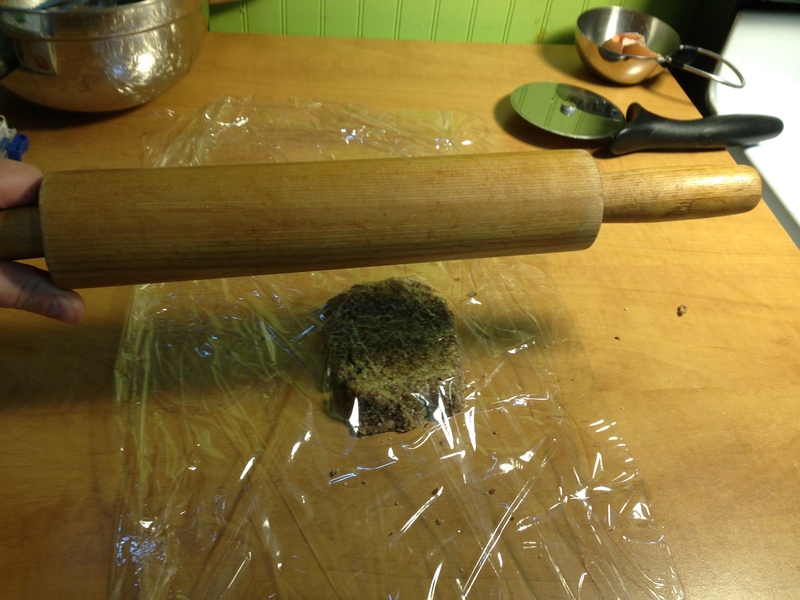 The recipe’s advice to use layers of plastic wrap or parchment made sense. 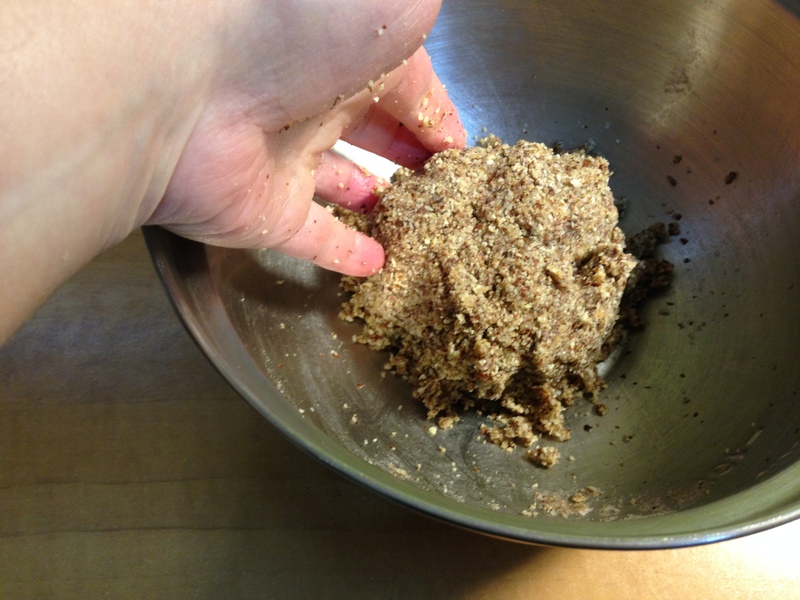 The dough was much more sticky and crumbly than a typical wheat-based dough. 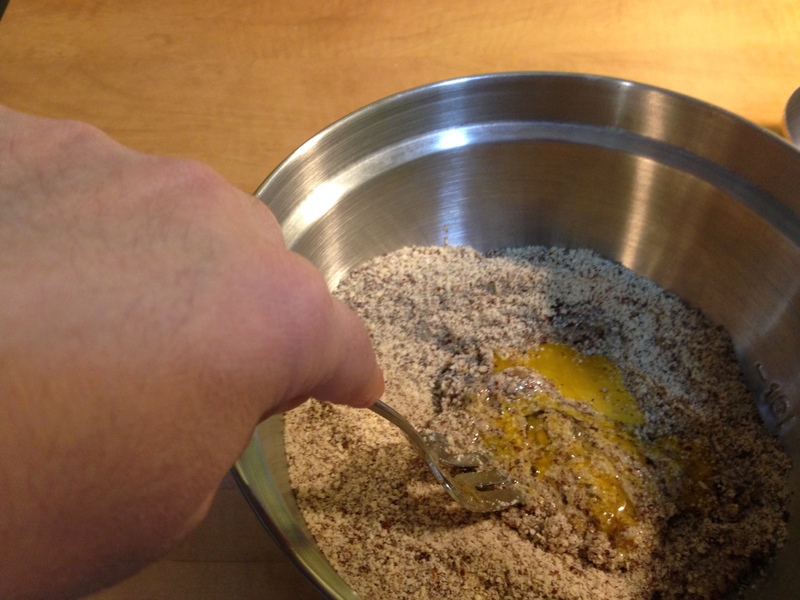 This is where the difference between grain flour and nut flour became quite obvious. 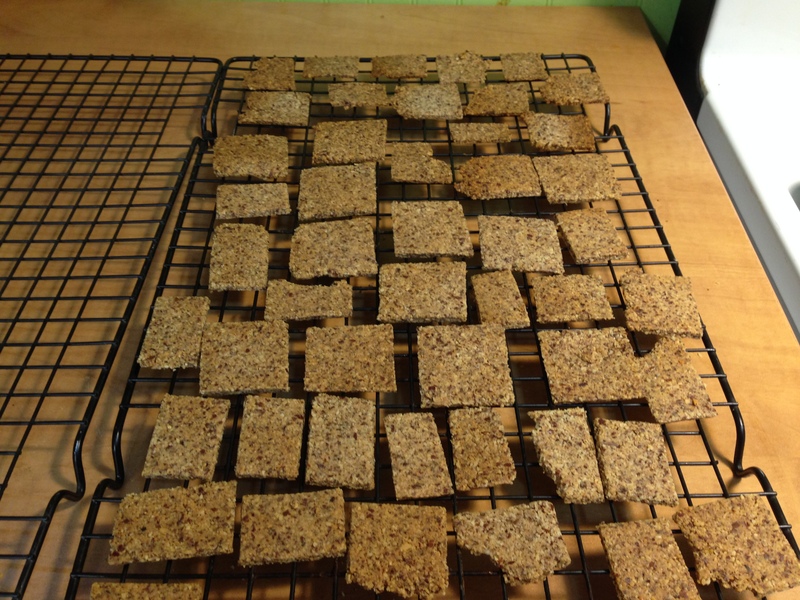 The edges of each batch were very thin, dry, and crumbly. Re-rolling crumbled dough was not easy, as the moisture from the egg seemed to dry up quickly. My final crackers were not evenly sized and not all of them reached 1/8th inch thickness. I will say that a pizza cutter is the tool to use for cutting these, though. Here they are, baked and ready to munch. 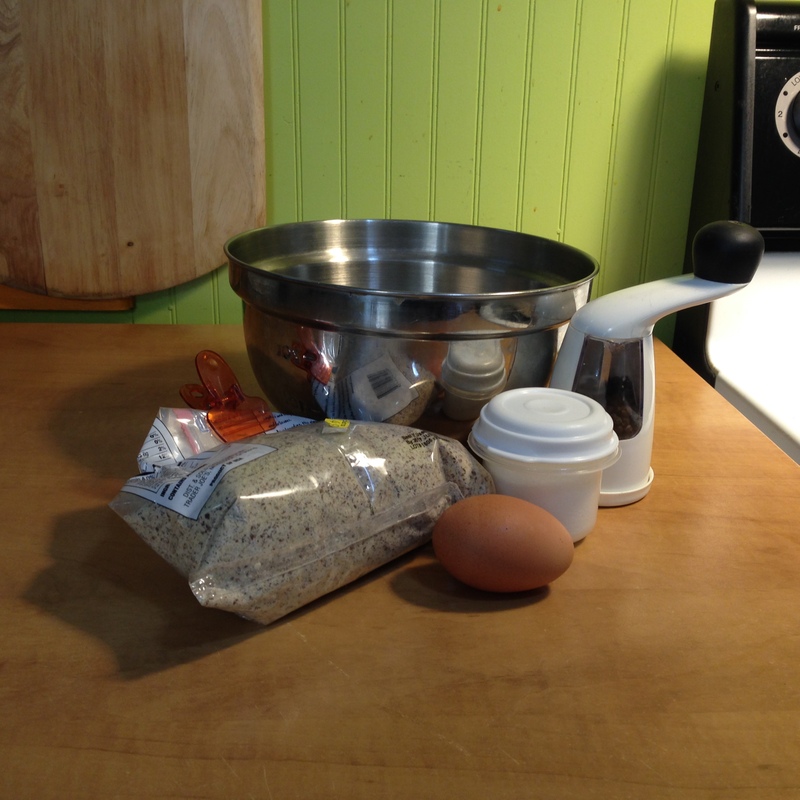 This was quite the nut-flour experiment. I am glad I tried it. The results were interesting. Essentially, these are crushed almonds glued together with egg protein, which is not a bad thing in and of itself. They definitely tasted of toasted almond. Mr. Food It Yourself felt they needed “something”, but he could not quite define what. I agree that beyond almond-ness they are a bit bland. If I make them again I will take the recipe web site’s advice and look for finely ground almond flour. These seemed more like a novel way to munch on almonds than a grain-alternative cracker. I would definitely try the seasoning options noted on the recipe page. The hot sauce version is particularly attractive. We have lots of hot sauce in the Food It Yourself kitchen. Over all, I like these almond crackers. I may make them again in a more zesty iteration. Am I going to give up grains and grain products? No, I am not. However, there is a lot of fun to be had by experimenting with non-grain flours. I will definitely do more of that. What non-grain recipes have you tried? Did you like the result? Share in the comments!